Apple's expanding campus will remove surface parking from its complex but may add more cars to Cupertino's roads because of its increasing employee base. Photo by raneko. Steve Jobs, co-founder and CEO of Apple Inc., unveiled his company’s plans for a new campus for approval on Tuesday at the Cupertino City Council Meeting. The new campus will occupy 98 acres of land bought from Hewlett Packard Co., in close proximity to the existing Apple campus. Although the company is making an effort to become more environmentally friendly by increasing landscaping, doubling the amount of trees and removing surface parking, the company is also expected to increase in size by 20 percent. In addition to its underground parking lot, the new campus would include a four-story parking structure to accommodate a growing employee base and an ensuing car culture. The land currently occupied by the Apple campus dedicates only 20 percent to landscaping, with most of the remaining land taken up by asphalt parking lots. The new campus will be much bigger than its previous location, and it will dedicate 80 percent of land to landscaping and move parking to an underground lot. At the city council meeting, Jobs explained that the new structure would rely on the local energy grid as a back-up power source, and instead, would use its own energy center as a primary source, generating energy from cleaner sources like natural gas. 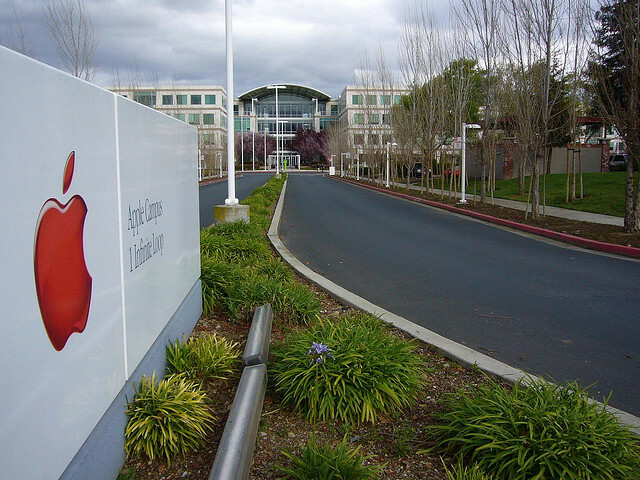 Today, Apple employs 9,500 employees and is the largest taxpayer in Cupertino, California, Jobs explained. With the construction of the new campus, Apple hopes to grow to 12,000-13,000 employees. In response to this growth, Councilmember Barry Chang asked Jobs about traffic concerns. Though it was a vague response, Jobs explained earlier that many of Apple’s employees live near work and ride bicycles to access their jobs, a near perfect model of “New Urbanism.” In addition, Apple provides bus services to employees from San Francisco to Santa Cruz using biodiesel-fueled vehicles, but the fleet is only 20 buses. Can Apple have a greater impact on sustainability by offering more incentives to employees to choose public transportation? The company is looking to quickly move forward with construction plans with a move-in date of 2015. Here are some images of the proposed complex. What do you think of Apple’s new campus?